Rajnath Singh led BJP has retained Himachal Pradesh BJP leader Anurag Thakur as the party’s national Yuva Morcha chief (BJYM). 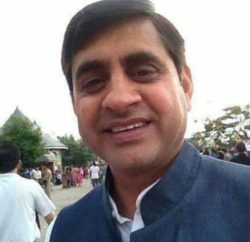 Thakur, a two-time Lok Sabha member from Hamirpur in Himachal Pradesh, was entrusted with the second term for the coveted post. 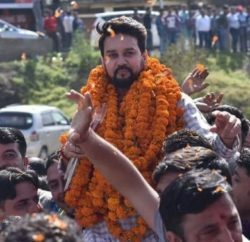 Anurag Thakur thanked the party high-command and vowed to utilize the opportunity to further rejuvenate the organisation in the run up to the next general elections. Thakur said that it’s recognition of the Morcha’s work done in highlighting corruption and the failures of the government on the economic and internal security front. 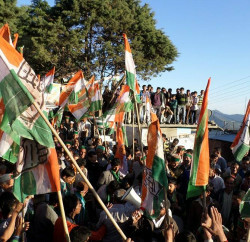 The major highlight of Thakur’s tenure as the Morcha chief was the national Ekta Yatra taken out in January 2011. He was arrested along with other senior BJP leaders on Jammu-Srinagar border while they were on their way to Srinagar to hoist the national flag at Lal Chowk on Republic Day. Anurag Thakur also a President Himachal Pradesh Cricket Association and had became youngest President of Himachal Pradesh State Cricket Association at the age of 25. He was also a youngest national selector at the age of 26 years in the year 2001 to select Indian Junior Cricket teams. Thakur is also a President of State Rifle Association, Himachal Pradesh and General Secretary, Himachal Pradesh Olympic Association, General Secretary, Hockey Himachal Pradesh. He is also an Executive Member, India Olympic Association and hold the post of Joint secretary, BCCI. Another BJP leader from Himachal Pradesh JP Nadda was also retained on the post of General Secretaries. However Senior Leader Shanta Kumar was not listed in the new team.